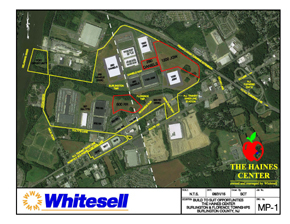 Whitesell is proud to announce three new build to suit opportunities located at the Haines Center. 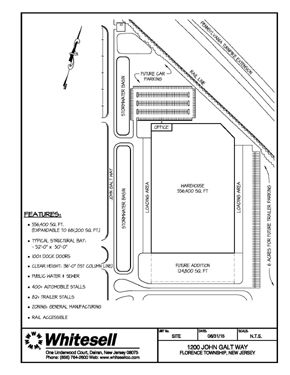 The sites include 290 Daniels Way, a 131,469 sf single / multi-tenant building, 600 Richards Run, 251,539 sf single-tenant building, and 1200 John Galt Way, a 556,400 sf rail accessible, single-tenant building. 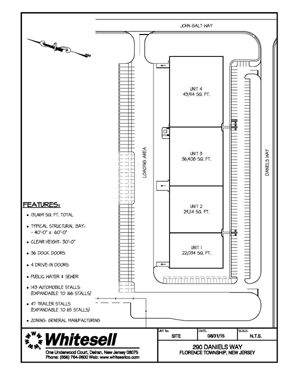 Each of the build to suit lease opportunities will feature modern tilt-up construction, ESFR sprinkler, T-5 lighting, plentiful loading, and ample car and trailer stall positions at prime sites within the industrial park. With preliminary site approval and existing infrastructure in place, the sites are build-ready, and located in two business friendly townships. 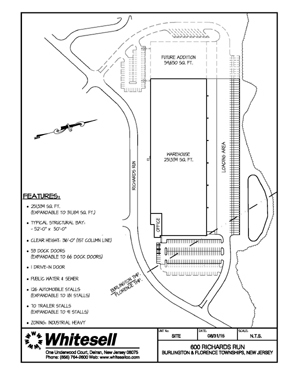 Site specifics and additional details are available for each property via the link attachment below. The 800 acre, award-winning Haines Center is an exceptionally maintained, master-planned industrial development with significant infrastructure investment that enables direct access to major highways. Ideally situated at New Jersey Turnpike Exit 6 and the Pennsylvania Turnpike connector and less than an hour’s drive to the ports of New Jersey and Philadelphia, its location enables firms to reap the competitive benefits enabled by same day delivery to a 25-30 million person market area. Employees at the industrial park also benefit from an onsite regional commuter rail station within walking distance of the build to suit site opportunities.